The children’s royalty crowned for the Mothman Festival include, from left to right, front row, Anthony Brinkman, Little Mister King; and Makaela Hamby, Tiny Miss Queen. Back row, from left to right, Vivienna Montgomery, Little Miss Queen; Jasmine Wright, Junior Miss Queen; and Makayla Billings, Young Miss Queen. The 2018 Mothman Festival Royalty is, from left to right, Susie Potter, Ms. Queen; Jessica Saddler, Miss Princess; Madison Stalnaker, Miss Queen; Gracie Queen, Teen Miss Queen; Chloe Armentrout, Teen Miss Princess; and Wendi Williams, Mrs. Queen. The 2018 Erika Westfall Memorial Spirit Award was voted on by all of the contestants in this years pageant. 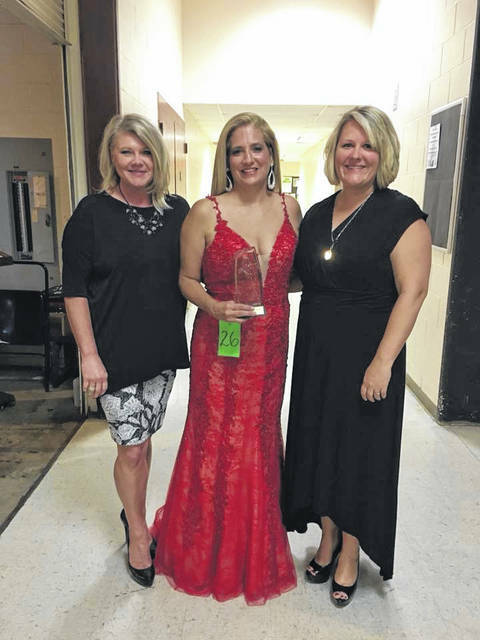 The winner, Wendi Williams, is pictured center with Amber High, left, and Miranda Brooke, right. High and Brooke are Erika’s family and attend the pageant each year to present this award that is in memory of Erika, a former Mrs. Mothman Festival Queen. POINT PLEASANT — The 2018 Mothman Festival Pageants may have been held outside of the county where the Mothman once roamed, but for this year’s pageant contestants, the location did not matter, it was all about bringing home the coveted 2018 Mothman Festival Pageant titles. Those crowned festival royalty this year include: Makaela Hamby, Tiny Miss Queen; Vivienne Montgomery, Little Miss Queen; Anthony Brinkman, Little Mister King; Makayla Billings, Young Miss Queen; Jasmine Wright, Junior Miss Queen; Chloe Armentrout, Teen Miss Princess; Gracie Queen, Teen Miss Queen; Jessica Saddler, Miss Princess; Madison Stalnaker, Miss Queen; Susie Potter, Ms. Queen; Wendi Williams, Mrs. Queen. The 11 pageant winners will reign over this weekend’s 17th Annual Mothman Festival. They will greet those in attendance, participate in helping with events, and also enjoy the popular hayride in the TNT area. Pageant Director Delyssa (Huffman) Edwards expressed how thankful she is for the support from the community for the past 10 years. Edwards continued to say the move was because of the amount of contestants the pageant drew. Edwards said her contestants this year really appreciated the improvements. In addition to the 11 festival titles, others were crowned during the event. Dragonfly Princess titles (going to those that collected in the most food donations in their age group), went to Ella Grant, Vivienne Montgomery, Sophia Jackson, and Lacey Wolfe. The Dragonfly Queen title (girl contestant who brought the most food donations) was captured by Paizleigh Painter. Dragonfly Prince is Anthony Brinkman and Dragonfly King is Joshua Long. The Fan Favorite or Butterfly Princess titles went to Karma Abshire, Sophie Bryan, Mya Buckle, and Hannah Dean. Vivienne Montgomery won Butterfly Queen and Joshua Long won Butterfly King. Other special awards included the Carolin Harris Memorial Community Service Award, an award Edwards added in 2017 as a way to remember the festival co-founder and pageant supporter. This award is given to the contestant in the Teen, Miss, Ms., and Mrs. division that collects and donates the most non-perishable food items. This year’s recipient was Addison Fisher of Greenup, Kentucky, who herself donated close to 350 items. A total amount collected from all 48 contestants was 3,210 items that were donated to the Mason County Action Group. Harris’ family is very thankful the pageant remembers Carolin in this way, and the action group also are grateful for the donations. In addition, this year’s Erika Westfall Memorial Spirit Award, which is voted on by the contestants, was presented by Amber High and Miranda Brooke. High and Brooke are Westfall’s family. Westfall was Mrs. Mothman Festival Queen 2013 and lost her battle with cancer in 2016. The family has attended the pageant previously to accept a donation that was collected for Erika’s son, Colton. Now the duo returns to present the award in memory of their sister and friend. The 2018 recipient is Wendi Williams. This year’s pageant also supported the Todd Stubbe Dream Foundation. Set up by Morgan Smith Stubbe, a former Mothman Festival Princess, this foundation is in memory of her husband and entrepreneur in Parkersburg, who lost his life earlier this year. From the sales of the basket raffles, this years pageant is able to donate $450 to Morgan to support the goals of the foundation. Tiny Miss Queen Makaela Hamby is the four year old daughter of Chelcie Barnett and Tim Hamby of Huber Heights, Ohio. 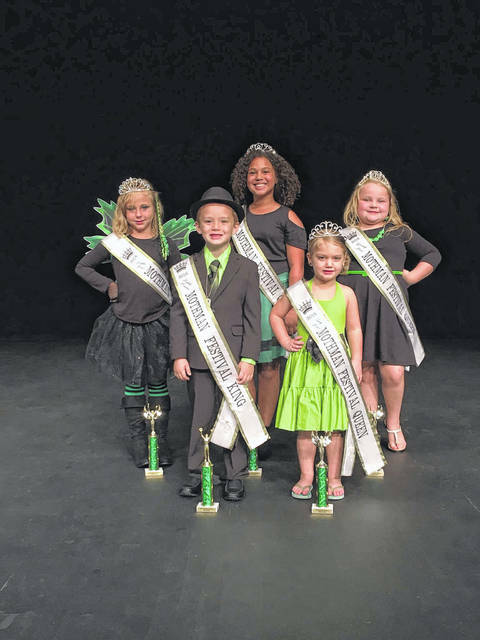 First runner-up went to Ella Grant of Southside; second runner-up to Karma Abshire of Ripley; Photogenic, Braylon Sweeney of Point Pleasant. Crowned Little Miss Queen, Vivienne Montgomery is from Gallipolis, Ohio and is the six year old daughter of Linnie and April Montgomery. First runner-up went to Kaiori Abshire of Ripley; second runner-up and Photogenic, Arianna Barr of Ripley. In the Little Mister division, Anthony Brinkman won the title. He is six years old and the son of Samantha Fulton and Christopher Brinkman of Jerusalem, Ohio. First runner-up and Photogenic went to Joshua Long of Gallipolis; second runner-up went to Braydon Sweeney of Point Pleasant. Makayla Billings captured the Young Miss title. She is the seven year old daughter of Jared and Sarah Billings of Gallipolis Ferry. First runner-up and Photogenic went to Sophia Jackson of Marietta, Ohio; second runner-up, Chloe Gee of Jackson, Ohio. Jasmine Wright is this year’s Junior Miss Queen. She is the 11 year old daughter of Kristopher and Jessica Madison of Belpre, Ohio. First runner-up went to Devann McCormick of Rock; second runner-up and Photogenic went to Alexa Wilson of Belpre. In the Teen Miss division, Gracie Queen won the Teen title and Photogenic. She is the 15 year old daughter of Denise Queen. Crowned Teen Miss Princess is Chloe Armentrout of Milton. She is 13 years old and the daughter of Glendoria and Phillip Armentrout. First runner-up in this group went to Olivia Buzzard of Washington; second runner-up went to Victoria Sovine of Milton. Madison Stalnaker is this year’s Miss Mothman Festival Queen. She is the 17 year old daughter of Rick and Monica Stalnaker of Hurricane. 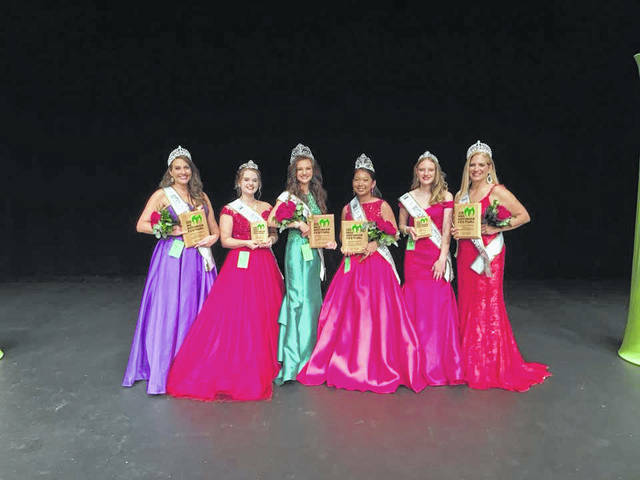 Jessica Saddler, 19, of Athens, Ohio, claimed the Miss Princess title. She is the daughter of Christine Davis and Shaun Saddler. First runner-up in Miss was Madison Neiswonger of Beallsville, Ohio, and second runner up went to Katina Nicholson of Pennsboro. Siera Toles of Point Pleasant won Miss Photogenic. Winning the Ms. title was Susie Potter. She is 32 of Goldsboro, NC. First runner-up and Photogenic went to Darian Miller of Gallipolis; second runner-up was Addison Fisher of Greenup, KY. Crowned Mrs. Mothman is Wendi Williams of Parkersburg. First runner-up and Photogenic went to Meghan Knapp of Milton. Second runner-up went to Jessica Madison of Belpre. https://www.mydailysentinel.com/wp-content/uploads/sites/14/2018/09/web1_0914-1-1-1.jpgThe children’s royalty crowned for the Mothman Festival include, from left to right, front row, Anthony Brinkman, Little Mister King; and Makaela Hamby, Tiny Miss Queen. Back row, from left to right, Vivienna Montgomery, Little Miss Queen; Jasmine Wright, Junior Miss Queen; and Makayla Billings, Young Miss Queen. https://www.mydailysentinel.com/wp-content/uploads/sites/14/2018/09/web1_0914-2-1-1.jpgThe 2018 Mothman Festival Royalty is, from left to right, Susie Potter, Ms. Queen; Jessica Saddler, Miss Princess; Madison Stalnaker, Miss Queen; Gracie Queen, Teen Miss Queen; Chloe Armentrout, Teen Miss Princess; and Wendi Williams, Mrs. Queen. https://www.mydailysentinel.com/wp-content/uploads/sites/14/2018/09/web1_0914.Erika-Westfall-Award-1.jpgThe 2018 Erika Westfall Memorial Spirit Award was voted on by all of the contestants in this years pageant. The winner, Wendi Williams, is pictured center with Amber High, left, and Miranda Brooke, right. High and Brooke are Erika’s family and attend the pageant each year to present this award that is in memory of Erika, a former Mrs. Mothman Festival Queen.